Our equipment can be found in operation all over the world, from small businesses to large organisations, many of which are well-known household brands. We supply industries such as Food, Pharmaceutical, Chemical, Environmental and Plastics, offering innovative solutions from full systems to small applications and spare parts. Trantec’s in-house materials testing facility allows us to fully understand the behaviour of your product. Upon completion of testing, we provide a report detailing our findings along with our recommendations. This, along with our expert product advice and our in-house design service, enables us to deliver a cost-effective, tailor made solution ideal for almost any application. Our aim is to meet each individual customer’s needs. At our modern production facility in Clayton-le- Moors, Lancashire, our enhanced manufacturing techniques can be adapted to produce superior products for almost any application. We understand one Screw Feeder cannot meet every customer’s requirements. Utilising the latest powder dosing technology, Trantec’s Metering Screw Feeders can be quickly configured to meet the demands of almost any application without compromising Trantec’s proven powder dosing technology. An option of motors – AC 3 phase motor as standard, DC Motors for slower speed capabilities and Servo Motors for maximum accuracy, precision control and maximum feed range. Stainless Steel AC motors also available. Specially designed Dry Running Shaft Seals – 100% food compatible and easy to replace. Quick-release / Easy-clean Features – saving time and effort when dismantling your machine for quick and easy cleaning and of course, reducing downtime. Ranging Storage Capacities – with manual refill or automatic refill options. Integrated Weighing Base & PLC Controls – for added precision and feed accuracy. 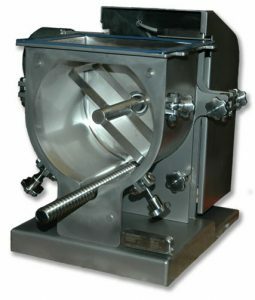 Gravimetric controls can be installed, with both batching and continuous Loss-in-weight and Gain-in-weight configurations available. Independently Driven Product Agitator – controlled conditioning via a separate motor drive and gearbox combination, specifically selected to suit your material properties. A selection of stainless Polishes and Finishes – from simple welds as Laid, to mirror finish. Painted finish (mild steel only), Bead Blasted or standard bright polished. For food applications, we use EC & FDA approved materials of construction. 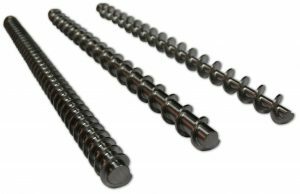 Trantec have supplied an array of replacement Auger Screws for use in Powder Dosing Systems, Metering Screw Feeders and Filling Machines. Often the replacement part is only available from the original equipment manufacturer, who charges a premium for such a bespoke component. Trantec now offer a custom-made auger manufacturing service and specialise in supplying replacement parts for existing auger-screw based machinery at a fraction of the price of the OEM. Trantec specialise in producing full flight augers, investing in state-of-the-art Computer Aided Design (CAD) and Computer Aided Manufacturing (CAM) as our method of production, offering compete interchangeability. Quality and reproducibility are inherent to our production process. Fractions of a millimetre in accuracy are typical and can be maintained across batches. This method of manufacture produces a stronger, more robust auger that is long lasting and very cost-effective. Not all customers require a full flight screw, with some customers opting for the simpler spiral type auger. Trantec have added to their development program by including the manufacture of customer-made spiral augers in a variety of shapes, sizes and finishes. Construction materials include 304 or 316 stainless steel, mild steel and UHMWPE for full flight augers. For spiral augers we offer 304 or 316 stainless and mild steel. We offer a variety of finishes including welds as laid, standard, crevice-free and mirror finish. For food applications, we use EC & FDA approved materials of construction. 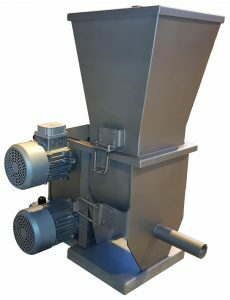 Flexible Screw Conveyors offer efficient, low-cost transport of Powders and Dry Bulk Solids, conveying materials such as very fine powders, granules, flakes, pills and large pellets. Whether your material is free-flowing or poor-flowing, Trantec can produce Flexible Screw Conveyors for the most demanding applications. We offer tailor-made units, both stationery and mobile, with customized, interchangeable components including Spiral, UHMWPE Tube, Motors, Hoppers, Controllers, Sensors and more. Trantec’s Flexible Screw Conveyors are constructed in mild steel, 304, or 316 stainless steel, with a variety of finishes to choose from including welds as laid, standard, painted (mild steel only) and ground crevice-free. Easy-clean, quick-release features can be included for ease of cleaning, reducing downtime. For poor flowing materials, an agitation device may be required to constantly condition and break up the material, avoiding build up. The type of agitation can be specifically selected for the application to suit the material flow properties. Vibratory agitation is occasionally used for certain powders and granular materials that cannot flow with traditional techniques, but this is far less common. Trantec’s agitation devices are independently driven, providing precise control of speed of rotation and levels of product conditioning. For materials with a high risk of degradation, a dust hood with curtain can be fitted to the hopper for a dust free environment. Trantec’s Powder Samplers are designed to remove specimens of powders and dry bulk solids from static or moving materials, accurately and reliably. 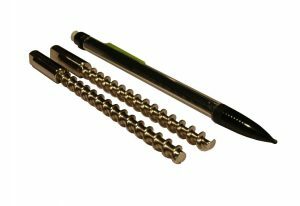 Consisting of just one moving component, the auger screw, Trantec’s Powder Samplers offer minimal maintenance. Their simplistic design means cost-effective construction is achieved with low power consumption as standard. Our Powder Samplers can be used in most industries however, they are widely used in dairy manufacturing for sampling milk powders or baby formula, also in pharmaceutical processes as part of their strict quality monitoring standards. Trantec’s Powder Samplers are configured for volumetric feeding and are more suited to free-flowing materials from fine powders to harsh granules however, for poor-flowing materials, we can offer additional features to aid product flow where necessary. Materials samples can be continuous or in batches and can be sampled manually or automatically, to suit your application. Construction materials include mild steel, stainless steel 304 or 316 and we offer a variety of polish finishes including welds as laid, standard, crevice-free and mirror finish. For food applications, we use EC & FDA approved materials of construction. 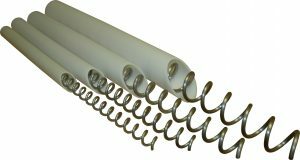 Trantec supply replacement Spiral and Tube for Flexible Screw Conveyors. Our parts are supplied to the same, exacting standards as the original equipment manufacturer (OEM), providing guaranteed interchangeability, at a sensible price. Transferring to Trantec’s Flexible Screw Conveyor spares has made a difference to many small businesses, universities, multinational companies and household brands, helping them save money and further improve their processes, omitting the need to return to their original OEM. Our Conveyor Spiral is coiled from 316 stainless steel or carbon steel, available in round, flat or square section. We can provide custom-made spiral to your exact requirements, or you can buy many standard sizes ex-stock. Our Conveyor Tube is extruded from hard waring UHMWPE (Ultra High Molecular Weight Polyethylene) which is FDA and EC approved food contact material and is available in a range of sizes with many sizes ex-stock. Amongst our range of materials handling solutions, Trantec can provide a range of Auxiliary Equipment to add safety and ease for depositing and storage of your powders and dry bulk solids. Emptying sacks and bins at a height can be quite difficult and often dangerous for those involved. With health and safety being an ever more present issue in the workplace, Trantec can assist with all areas of your process. Trantec’s Storage Hoppers provide a cost-effective method of space saving. 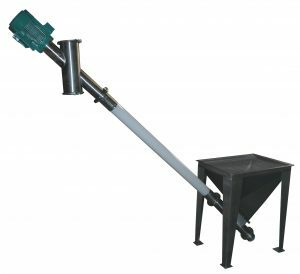 A temporary storage method of materials, a hopper can be customised to feed straight to your Flexible Screw Conveyor, Metering Screw Feeder, or almost any other type of process equipment. Designed to allow safe deposit of boxes and sacks, Trantec’s Sack Tip Stations provide a health and safety aid to any application. Simply place the sack/box onto the front rest to be cut open and empty accordingly into the hopper. The hopper will then feed the contents to your conveyor, screw feeder, or other process machinery. Dry bulk solids are kept fully contained with the addition of dust curtain, taking away any risk of cross-contamination. 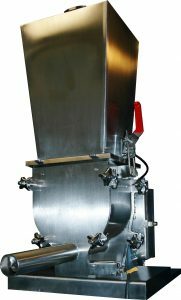 Trantec’s FIBC (Flexible Intermediate Bulk Container) Dischargers ensures complete discharge of materials under controlled conditions, maintaining complete safety. Used widely across the food, pharmaceutical, chemical, and plastics industries, our models are available for both free-flowing and poor-flowing materials and can be supplied standalone or in multiples. Configurations will be determined by product flow properties and application specifications, therefore offering the most cost-effective packaging media for intermediate bulk projects.